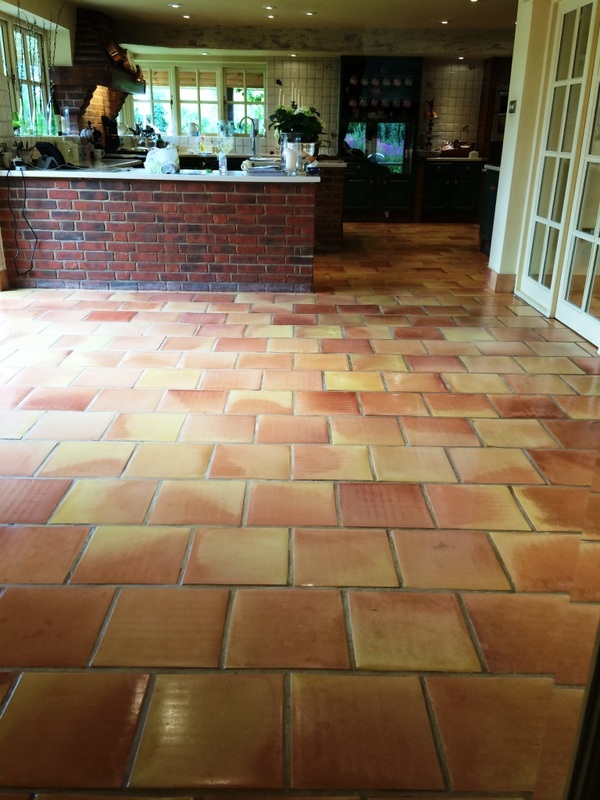 I was contacted by the owner of a Terracotta floor at a house in the old village of East Tytherley near Salisbury, the floor was in good condition and was just in need of a regular deep clean and seal with extra attention along the grout lines which had darkened, additionally there appeared to be evidence of efflorescence that would need attention. 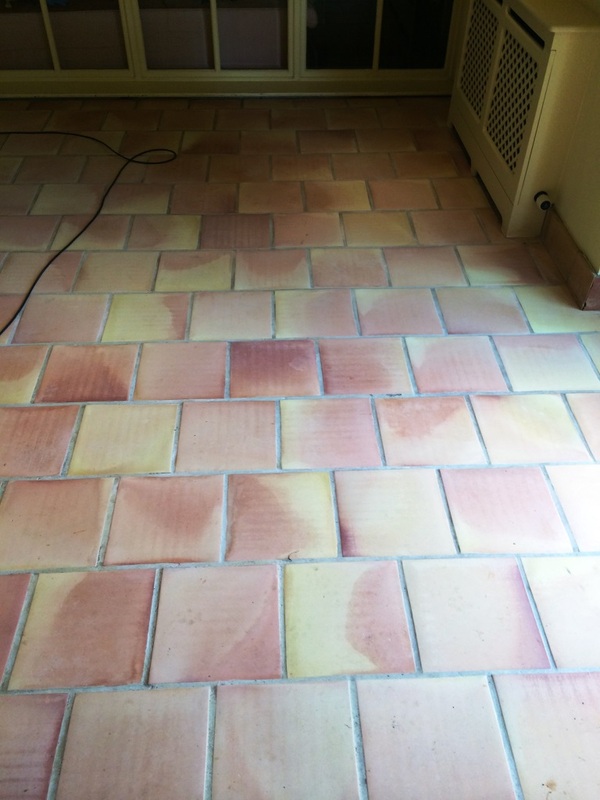 We started by smothering the floor with a strong solution of Tile Doctor Pro-Clean mixed 50/50 with Nanotech Ultra Clean leaving it to soak into the tiles for twenty minutes to give it time to eat through any dirt and remaining seal. The solution was scrubbed into the grout using a stiff grout brush followed by the use of a black scrubbing pad fitted to a rotary machine. We made sure each tile was scrubbed in this manner four times to remove all the dirt and remaining sealant. Then we removed all trace of slurry and product by using clean water and a deck brush several times using a wet vacuum to remove the water. To treat the efflorescence we then applied a dilution of Tile Doctor Grout Clean-up to the affected parts of the floor and used a stiff deck brush to remove the salts again rinsing the floor with clean water afterwards and removing it with a wet vacuum. 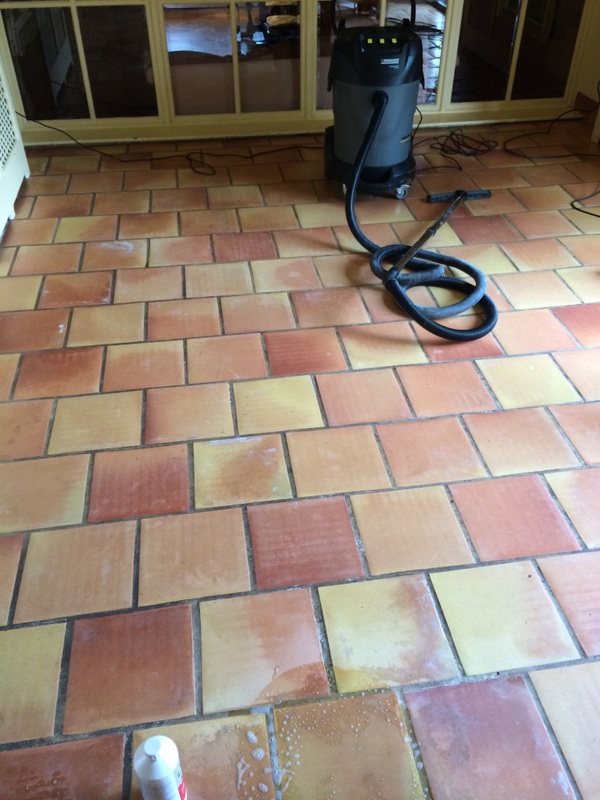 We then left the floor to dry for ten days as Terracotta is very porous and can take time to dry. When I returned ten days later the first thing was to test the floor with a damp meter which confirmed the floor was dry and good to seal which was done using ten coats of Tile Doctor Seal and Go which will protect the tile from stains going forward and also adds a nice subtle sheen to the terracotta.